I've always considered myself to be a pretty "glass half full" kind of person. I'm the world's most positive sports fan, always believing that a comeback is possible (as long as there's legitimately a small glimpse of hope). I enjoy the little things, talk myself into being less stressed than I am, and sometimes naively see the best in people. But recently, I've caught little glimpses of negativity in myself- all dealing with situations where things were broken. Situations where something went wrong unexpectedly, and instead of focusing on all the good around me and making the best of it, I spent my time focusing solely on the flaws, and being upset that my "perfect" expectations had crumbled. Situations I felt I didn't deserve, that shouldn't have happened. 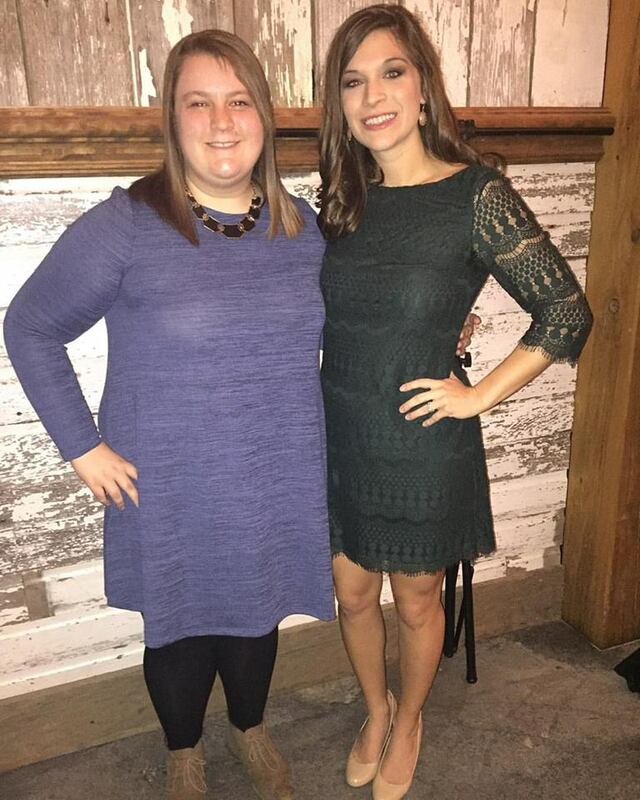 After deciding against my typical teacher cardigan attire, I searched near and far for the perfect long sleeve dresses to wear to the three wedding events we had back to back to back. (Who knew December and January weddings were so popular?) I finally found a few different dresses that I really liked, and after going back and forth about which ones to keep, my sweet hubby told me to keep them all. Of course, my very favorite one was the most expensive, and the only one not on clearance, so I saved it to wear to the last wedding. Here's a picture of the whole dress, as my friend Michelle and I prepared to tear up the dance floor. I was so excited to wear it, and it actually made me feel pretty, which isn't always and easy feat. The wedding was beautiful, the reception was a blast, and we all had an amazing time getting our groove on and celebrating love. And then, during the pick-up process, "tragedy" struck. I was taking items off of the head table, and inadventently leaned up against a nail that was sticking out from the front of the table. I felt a slight tug on my dress, and then instant panic shot through me. You guessed it...I had ripped a small part of the lace on my dress. Now honestly, you wouldn't even notice if I didn't point it out to you. But I knew, and I was upset. Here was this beautiful dress, brand new, the first time I'm wearing it, and of course I have to go and mess it all up. I was mad at myself, mad at the situation, and of course all I could see was the flaw in the dress. Fast forward a few days. I was sitting at a basketball game with my husband, only to look down and suddenly notice that a diamond was missing from my wedding ring. Somewhere in between my 9 Round workout, showering, and coming to the game, one of the little rings had been lost somewhere. I had yet to lose a diamond from this ring in the three years that I'd been wearing it, and I was really upset...let's just say all I could look at was that small gap where the diamond should be. Here was this beautiful, amazing ring that my hubby had picked out for me and scrimped and saved for, and all I could see was the imperfection- which wouldn't even be noticeable to most people. I was, again, annoyed at my luck. Note the small diamond missing to the top right of my main diamond. LESSON ONE: Keep things in perspective. Yes, it would be nice if things that I spend money on never had to be fixed, but let's be real- that's life. Just this week alone, we've had the handle on our refrigerator break, the door on our laundry fall off, the crack on my windshield expand, and of course the dress and ring episodes. I told Aaron one night as we were falling asleep that my life was falling apart. Dramatic, I know. When it rains, it pours, but thankfully all of these things were things that could be fixed relatively easily with a few phone calls, some elbow grease, and a needle and thread. With so many positives to focus on in this world, why waste time dwelling on the negative? Not to mention, the reminder that material things don't provide true worth in this world. LESSON TWO: We've got to look past imperfections around us and love IN SPITE of those imperfections. I'm not perfect. Neither are you. No one is or will ever be. And yet, we've got family and friends and all sorts of wonderful people in our lives who continue to love us. Thank. Goodness. 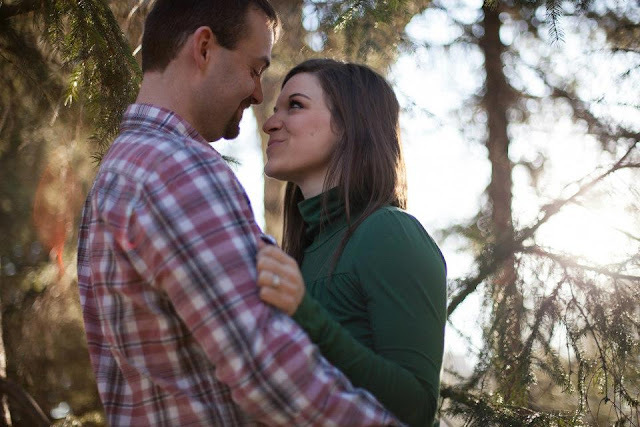 Thank goodness that my husband chooses to love me on a daily basis, despite all of my "missing diamonds" or brokenness that is all too easily visible. Thank goodness that my friends dismiss my flaws or help me work through them. And thank goodness that the Lord saw me in my sin and brokenness, yet considered me someone worth laying His life down on the cross for. LESSON THREE: The pressure to be perfect and live up to "perfect" expectations is not worth it. When we try to find our meaning in being the perfect everything for everyone, we will always fail. Instead, we've got to embrace the times when things go wrong, and turn them into fun, spontaneous moments and memories. We've got to recognize our flaws, and embrace them as reminders of our imperfection and our need for a savior. We will never find meaning and purpose by giving ourselves the extra pressure to be perfect in life. LESSON FOUR: Just because things don't always go like we want them to, or we aren't given what we want, doesn't make God any less loving. Sometimes we think that if only something had happened the way that we wanted it to, or if only God would let this one thing happen- then life would be perfect. But so often, the things that we don't get (that we wanted) can end up being the biggest blessings for us in the end. I can look at my ring and choose to stare at that one, tiny square where a diamond is missing. I can get mad that it's not there and choose to see only its imperfection. Or, I can look at the beauty of my ring overall, and the love that it represents. A missing diamond doesn't mean Aaron loves me any less, just like something that goes wrong in my life doesn't mean that God loves me any less. (And yes, I am getting my diamond fixed in case you were wondering). I can sit and stare at the rip on the lace in my dress, or I can work to get it fixed, and keep my eyes set on the big picture. I can sit and worry about what I'm missing, what I wish I had, or how imperfect my life is. Or, I can sit and look at the beauty of all I've been given. And that is how I want to approach my life. 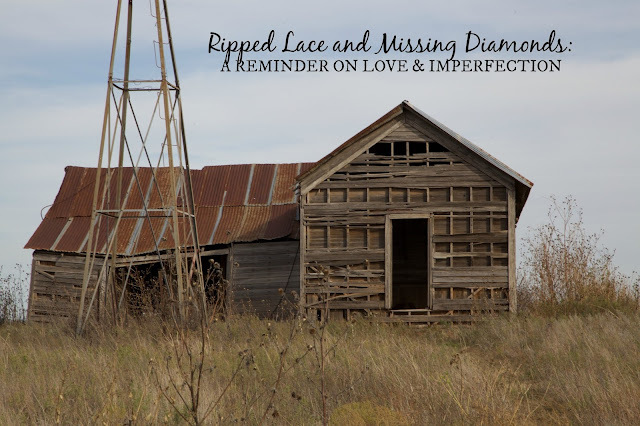 And so, I'm thankful for ripped lace, missing diamonds, and the reminder that I'm not perfect, and yet I am loved. That life will not be perfect, or always go as planned, but that's okay. And that keeping things in perspective will help me to enjoy the blessings that I've been given, instead of worrying about what I haven't been. I choose thankfulness. Will you? I'm linking up with A. Liz Adventures, Motivational Monday, Modest Mom Blog, Me, Coffee, and Jesus, What Joy is Mine, The Diary of a Real Housewife, Uniquely Unfolded, Grace and Love Blog, Grace and Truth, Running for Cupcakes, Momfessionals, Life in Leggings, Tell it to Me Tuesday, Bliss and Faith, Raising Fairies and Knights, Sweet Little Ones, Testimony Tuesday, Intentional Tuesday, The Painted Teacup, Twinkly Tuesday, Sitting Among Friends, Women with Intention, Waiting on Wednesday, Quintessential Mommy, and Messy Marriage. Wow, such wisdom here. My Eeyore heart want to look at the ripped and the missing, but slowly, I am learning to trust God with these things and to thank him for the given rather than focusing on the not-given. Thanks so much, Michele! Trusting God and thanking him is just a continual journey and something we have to commit to daily. Oh I can identify with this. I generally also am positive but if I get on a negative kick, I easily slip into complaining and I have noticed it more lately in myself too. Almost a desire to complain and find fault in situations and people. I must change this. I appreciate your post and the honesty in it. Right there with you! Thanks for your kind words, and for stopping by! This advice is so true. I am always worrying about things that have gone wrong when in reality they really aren't that big of a deal. My husband is always trying to ease my mind when I have a wardrobe malfunction! Thank you, Ashley! I do the same exact thing. Thank goodness for our hubbies! Oh Erin, thank you for being so wonderful!! You are such an encouragement and I really appreciate it. Love your words- God is always at work! As I was reading, I was thinking, "OMG Kelsie, go get that diamond replaced! Aaron paid a lot of money for that ring!" But then I realized that it's more than just a missing diamond. I like your perspective of things/events as they occur. I'm gonna practice this today at work. Thanks! I love how you were able to take these two frustrations and re-frame them the way you did. Thanks so much, Crystal! That is too funny- it is beautiful to see a bit of wear in those areas. I'm getting my diamond fixed, but I definitely see a missing diamond as much less of a tragedy now. Great post! You are very wise for being so young! Well thanks so much, Dominique. I appreciate you stopping by!! I'm sorry you lost a diamond, but I understand the initial panic. I had that happen to me at work and I stopped work to find it. Didn't care what my manager said. I completely understand that! It is a definite panic at first for sure! This post is on point. Thank you for sharing on Meetup Monday! Thank you, Lynn! You are so right! Thank you for sharing so openly! I agree, the pressure to be perfect is definitely not worth it. When we get all worked up over not being perfect, we waste time and emotion when we could be doing something simple to help get over the issue. I've definitely been there and it stinks! Thank you for being so positive and encouraging! Thanks for the encouragement, Natalie! I think we definitely waste our time and emotion in these areas when we shouldn't always do so! Well thanks so much, Sarah! Have a wonderful day! I love the message here. And the dress and ring are beautiful! Aww, thanks, Heather! You are too sweet! Fantastic post!!!! I have a pair of lacy pants that got snagged on a hymnal at church (we don't even use those things anymore) and ripped really bad. Shockingly no one but me ever even notices! Love that dress- and I never saw the rip! Yes, yes, YES. For some reason, this post brought up our first anniversary. We had just bought brand new phones (literally 24 hour old phones) and as I got out of the car, I forgot it was on my lap and it flew onto the concrete face down... annnnd shattered. We had been making a stop on our way to dinner. I cried and cried and we had to go somewhere else because we missed our reservation. But you know what? I look back at that day, and how it seemed so awful and not how it was planned... and it was beautiful just the same. We still celebrated a year of happiness. We ate. We drank. We loved. And yes, we made a funny (in retrospect) memory. Thanks for a great reminder, Kelsie! Oh wow! Thanks for sharing, Joy! I'm sure that wasn't much fun. I'm glad that you made it into a celebration just the same! Pretty cool how we can look back in wisdom someday on all those "bummer" moments. I feel you! Things do seem to come in clusters, which can magnify the issue unnecessarily:-). It's my nature to look at the missing diamond (I actually just had one fall out too! ), and I'm trying hard this year to have an attitude of gratitude! So true, Angie! I hope this made you look a little differently at that missing diamond! I'm right there with you- let's choose thankfulness! Aww, I know what it's like to feel bad about something bad happening to a beloved article of clothing. It happens to all of us, and it's even sadder when it's something new! But my motto for clothing is, "if it dies doing what it was made to do (being worn, that is), that's a worth death". Slightly dramatic, but that's why I wear my favorite clothes even if there's no special occasion. Love the perspective you had after taking time to reflect on these two events! I don't know how many times I have ripped my yoga pants or my favorite shirt by rubbing up on something. I always point out the flaw and see the item for the flaw. This is a great reminder of really savoring the small moments and not letting the moments were life is giving us lemons destroy our happiness. Thanks, Ashley! You are so right. We aren't given forever, so we've got to make the most of it! I'm sorry you lost that diamond, out of all the things that happened. Did you ever find it? I had that happen, but it happened at the jeweler's when he was cleaning it. Hope you find it. If not, it will be a constant reminder of your own imperfection, no? Great lessons that you learned by turning around all those negative things that happened and not so much making them positive, but by looking at what you can learn from them. That is how it turns into a positive. Love that dress, btw, but you look beautiful in everything you wear. I didn't find it! I did take it to the jewelers to get it replaced, as it was very small and cost next to nothing to replace, get cleaned, etc. Thanks so much for being so sweet! I love the dress a lot, but I know that I can't find meaning in my material things- so I'm thankful for this reminder. You are so kind! This was such a beautiful reminder Kelsie! This is my first time stopping by your blog (from the Blog Passion Project) and I admit that the name of the post drew me in! This post was absolutely spot on and has challenged me and encouraged me today. Thank you so much for sharing! I look forward to connecting with you more! So glad to have found your blog! Thanks so so much, Rebecca! I am glad you found the name interesting and liked the post! I am excited to connect more, and am so grateful you found the blog! Thank you so much! I am excited to have my ring back, with diamond intact, but I know that my reaction will be much different if it happens again. Where did you get so wise? Wow girl this is great. Looking forward to sharing it. I lost my engagement ring about five days after I got it. Thankfully, I found it several hours later hiding at the bottom of my sock drawer, but those were looooong hours. Life is hard and full of imperfections and I found myself totally relating to both your experiences . . . I would have been so upset. I had my first fender-bender since I was a teen last month and I'm still struggling with it. And my car is "perfect" again. Forgive all my rambling. Can you tell you hit a heart spot? Thank you for this. You blessed my heart! Oh, Deb, you're too kind :) Thanks so much! Great lessons! Though it can be difficult at times, our attitudes are a choice. We can choose to look at the flaws or choose to look at the beauty that shines through. I'm currently making an attitude adjustment in my own life, as I have been stuck too long looking at a loss of the past. I'm ready to turn around, face the future and enjoy the blessings that God has given me. I'm ready to live! Thank you, Joan! You are so so right! Every day we get to choose how to love other and spend our time. I can see how it would be hard to get past some losses. Blessings to you in this journey- I'll be praying for you! I've totally been there. I have high expectations of myself a lot and it just isn't worth it a lot of times. Totally! I'm right there with you girl. Letting go of these expectations is so freeing! Thank you for reminding us to look at the big picture and not drown in the little things and that make us sad! Be grateful, be happy and enjoy life! Well thank you for reading, Carmen! I'm thankful I was able to remind others of the same things I needed reminders of! I am so guilty of getting upset about little things like this too! You're right that it's so important to remember that God is good and His plan and timing are good, even when things don't go as we expected or as we would want. Beautiful post! It is so dang easy to get fired up about these kind of things. Easy to forget just what you sad- that these things are good even when they don't match with our plans. Thanks, friend! This is such a beautiful beautiful beautiful post! Totally warmed up my heart, the only thing I'm concentrating right now is to be grateful for little things and everything that I'm blessed with already! Well thanks so so much, Areeba! I hope that outlook changes your day! What a great post! It's a great reminder to keep things in perspective when we feel everything is going wrong. I love your positivity! Thanks so much, Lexi! I agree- it is so helpful to keep things on perspective. Thanks for your kind words! This was a GREAT post! Awesome reminder to put things into perspective! Well thanks so much, Annie! It really struck me this week and I feel like God put it on my heart to share with others! Been loving your content lately, keep it up sister! I love your perspective on this! I am definitely a person that will obsess over snaps in a sweater once they happen. I'm glad I'm not the only one, but I'm also grateful for the grace learned through the process! Thank you so much, Autumn. I hear you- it is so easy to get caught up in that. Grace is for sure a lesson to be learned again and again! Great perspective, Kelsie! It is so important to wrap your mind and heart around these thoughts at such a young age. It will help you so much if you decide to become parents. The comparison trap - the perfectionist trap - ugh... it is heavy in Mommy circles! God is speaking beautiful things to and through your heart! Way to go! Thanks so much, Lori! It is so hard. Thank you for the encouragement! Such great perspective. I am such a fun when little life events turn into major philosophical learning opportunities. Way to grow and stretch your thinking. Well done! Such a beautiful post and a great perspective to have in life! You can always turn something negative into a positive if you really think about it. Great post! Such a great post and I'm glad God still loves me with some of my fur rubbed off. Thanks for sharing. You're so right, Rebecca! Thanks for reading! I am exactly the same I always expect perfection and feel disappointed if it is not achieved. We need to stop being so hard on ourselves and embrace imperfection. Oh girl. I've been there myself in both situations. I only wish i had handled myself with such grace as you have. You've found the silver lining in these situations and turned them into beautiful lessons for us. Thank You for sharing! You spoke to my soul with this post. Well it definitely took me a little while to act with such grace. I wanted to cry as we left the wedding ha. But thank you for the kind words. I'm so glad it resonated, and I'm thankful for the reminder God gave to me through these events! I love it too. Thanks, Laci! You're so wise! Thanks for sharing this amazing blog post. Well thanks so much Greta for those kind words!